Jessi (rider),13, is fairly new to horseback riding and just entered her first Halloween themed horse show/Costume contest on Oct. 27, 2012. 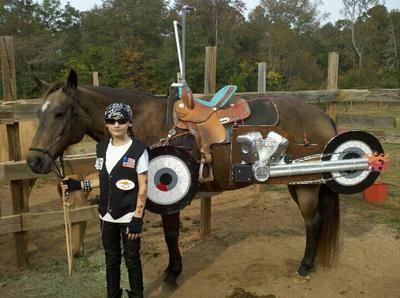 She is dressed as a biker, and farm horse, Dexter, is her motorcycle. This costume was very inexpensive to make and can be put together in a short period of time, although we spent a little extra time with the details. We started with standard foam poster board you get at Wal-mart. We drew then painted the wheels and cut them out. The other poster boards we used to mount the engine parts to. The cylinders for the engines are milk cartons that we simply cut in half, painted as desired, and mounted to the board with tie wraps, along with a couple of plastic canisters that we cut the bottom off of to make the crank case. We used cardboard wrapping paper tubes for the exhaust pipes and cut some flames out of construction paper. and tie wrapped everything together. then we painted the parts of the board you could still see the same color as the horse. The handle bars are made out of less than $5 worth of PVC pipe and fittings from Home Depot, glued together and painted then put electrical tape for grips. To mount the engines on the horse (one on each side) we simply used some sections of rope to tie the two together and let the whole thing hang over the horse's back. Then we strapped the handlebars on the horn with rubber bands and tie wrapped the front wheels on the breast plate. I had originally made a PVC contraption to fit over the horses head and hold the front wheel out in front of the horses legs and under his chin but he would not accept it so we went with the simple tie wrap and added another wheel for the other side. The horse accepted this costume with no problems whatsoever but the other horses in attendance were not so pleased with it. It took a few minutes to get a few of the other horses calmed down and used to this thing hanging off of Dexter. We had a blast making this costume and although we knew we could compete for first place with it, there were also some other great, creative costumes in the contest so we had to settle for 3rd place, not bad for your very first horse show ever. So cute! I love it, u did an AWESOME job with the description! Wow i've never seen anything like it! Well Done on such a creative costume! I love this costume! It was very creative and cute! Very clever and I love how great you did the great description. You are definitely in the running!